Commentary related to disasters worldwide. San Andreas Recap-What a Night at the Movies! 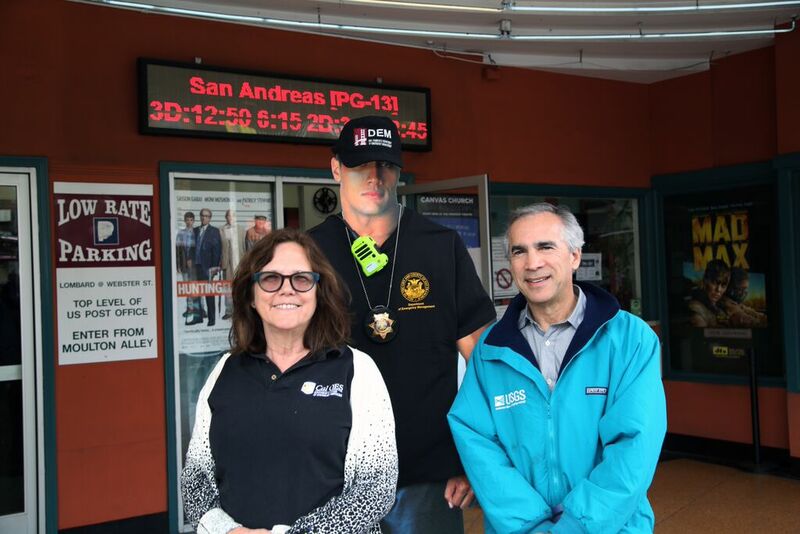 Last Friday May 29th, the San Francisco Department of Emergency Management and the San Francisco Film Commission joined forces to host a special viewing of San Andreas at the Presidio Theater. San Francisco digitally crumbled underneath a 9.6 magnitude earthquake and an impressively large tsunami proceeded to take down the Golden Gate Bridge! Dwanye Johnson delivered his action movie flare and although parts of the film were tense, we managed to share many laughs (and few “yahoos” during scenes with drop, cover, and hold on). ~ The importance of the “Drop, Cover, and Hold On” message for self-protection. ~The need for a backup and family reunification plan, always have a contact outside of the area all family members can report to! ~The movie demonstrates how critical previous training in first aid can be when trying to help others around you, as well as checking for injuries in times of distress. ~ Knowing that a physical sign of an impending tsunami can be seen in water that is receding. ~Cell phones are shown to not work after the earthquake in the film, with non-powered landlines remaining operational (however this may not last long either). Texting may work even better, and takes less bandwidth on networks, so Text First, Talk Second! ~The depiction of official Tsunami warning radio broadcasts and the use of sirens in San Francisco demonstrates how scientific information (delivered at the right time and in the right way) can save lives. Community members, emergency management professionals and earthquake scientists gathered for a fun film and were able to share some lessons about preparedness along the way! 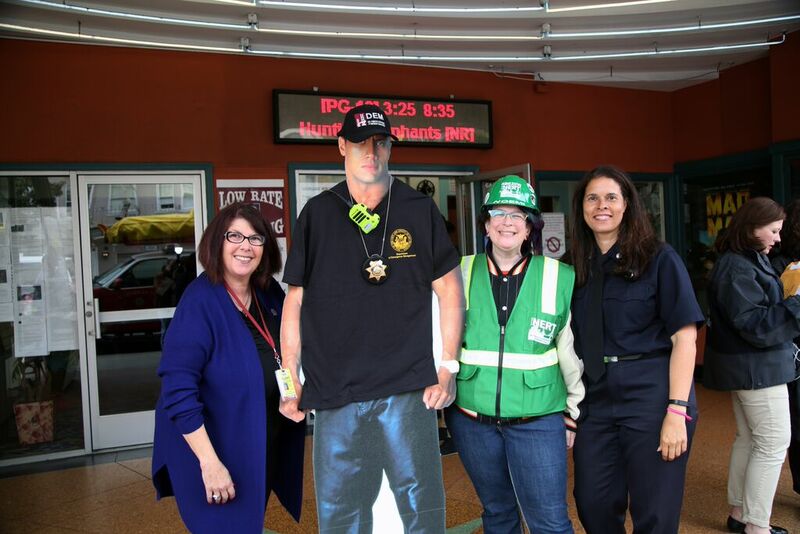 San Francisco Fire Department reps and DEM’s Kristin Hogan with our special guest! 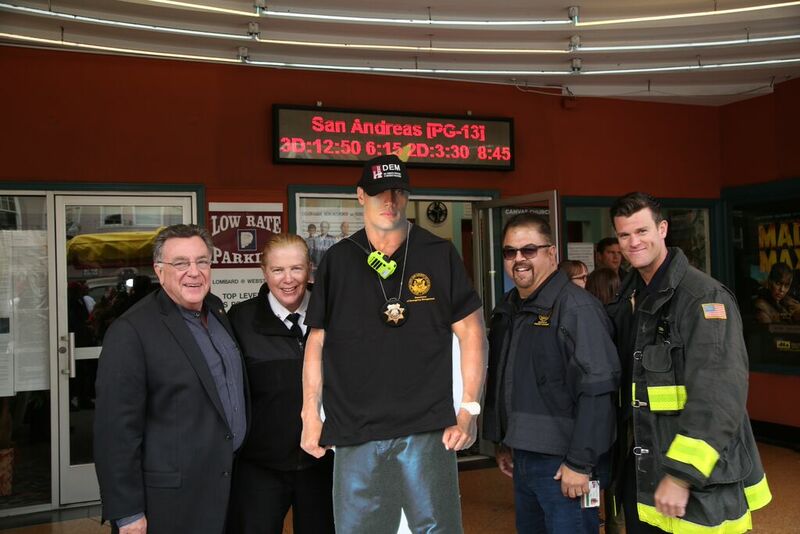 Lee Housekeeper, Fire Chief Hayes-White, Dave Ebarle, and SFFD Firefighter hanging with the man of the hour! Fellow N.E.R.T. members enjoying the scene! With that said you can rest assured that there are many organizations, agencies, and individuals that are working around the clock to prepare you for a natural disaster and to assist in responding and recovering. We will never see the Golden Gate Bridge get crushed by a tsunami or the damage from a subduction zone earthquake, nonetheless we should brush off our emergency preparedness kits and talk shop with our families about a plan. Panelist Amy Sinclair of the SFPUC discussing the importance of having stored water for emergencies. Visit SF72.org for preparedness and emergency kit tips! Over and out from the San Francisco Department of Emergency Management-back to work on keeping our communities safe! Preparedness is about connection, not catastrophe. Many of us were awakened early Sunday morning by the largest earthquake in the Bay Area since the Loma Prieta earthquake nearly 25 years ago. Thankfully, San Francisco suffered no damage. But we know that aftershocks in the region are common following a large earthquake of this magnitude. This is a good reminder that we need to do what can now, before the next earthquake, because that will make our City’s recovery all the more effective. But while we are taking stock of our emergency preparedness, we want to underscore this: emergencies look more like cities coming together than falling apart. And at the heart of this is connection. While Sunday morning’s earthquake is foremost on our minds, let’s use this as an opportunity to not only build upon our earthquake preparedness, but connect within our community networks about emergency preparedness in general. Have a conversation about preparedness with your family, neighbors, friends, and coworkers. Talk about what you would do if an earthquake causes damage in our city, and in our neighborhoods. Visit www.sf72.org to learn how to be prepared for earthquakes (along with any type of emergency), and ask your neighbors to do the same. 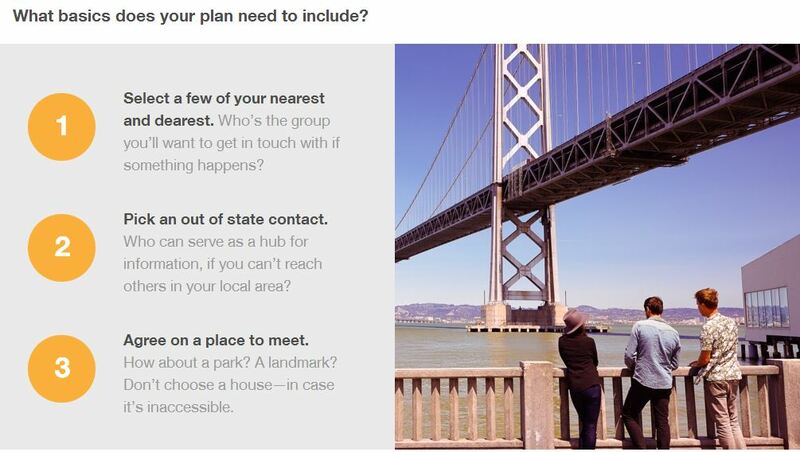 We also encourage everyone connect into emergency preparedness by taking the San Francisco Fire Department’s free Neighborhood Emergency Response Team (NERT) training, and register for the City’s e-mail and text-based notification system www.AlertSF.org. We know disasters, whether it is an earthquake, tsunami, or something human made, can happen at any time with little or no warning. That is why it is important to take steps now so we are ready for any emergency. Let’s not wait until the next disaster to show how connected and prepared we are. Today marks the third anniversary of the Tohoku, Japan Earthquake and Tsunami. The earthquake was a magnitude 9.0 and was the most powerful known earthquake ever to have hit Japan. The earthquake triggered powerful tsunami waves that reached heights of up to 133 feet and traveled up to six miles inland. Immediately after the earthquake, the National Oceanic and Atmospheric Administration’s (NOAA) Pacific Tsunami Warning Center and the West Coast and Alaska Tsunami Warning Center both issued tsunami warnings for Hawaii, the U.S. West Coast, Alaska and the island territories in the Pacific. A tsunami warning is the highest level of alert so DEM got to work, gathering in the early morning hours at our Emergency Operations Center and began issuing public alerts and warnings about the tsunami expected to hit the California coast line. Thankfully, the tsunami caused little damage. We were lucky. While the tsunami generated by the Tohoku Earthquake which hit Hawaii and the West Coast caused relatively minor damage, it reminds us of the need to be aware of how tsunami alerts and warnings are issued. 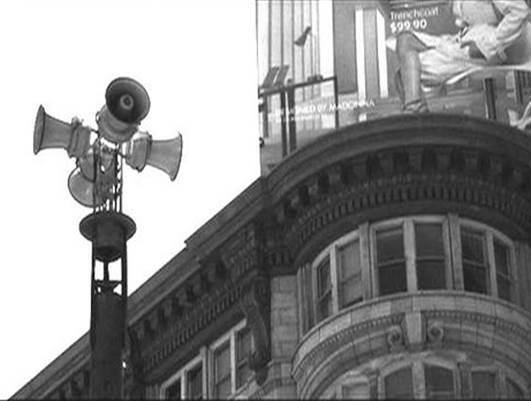 There are various alerting tools available, including the City’s Outdoor Public Warning siren system (Tuesday Noon Sirens); Wireless Emergency Alerts; and AlertSF, our text-based message system that delivers emergency information to mobile phones and other text-enabled devices, as well as email accounts. DEM also issues public alerts and warnings on Facebook and Twitter (@sf_emergency). In an emergency, the SF72 Crisis Map will also serve as San Francisco’s real-time information hub. You’ll find official updates, reports from our partners, and crisis map to navigate city resources. 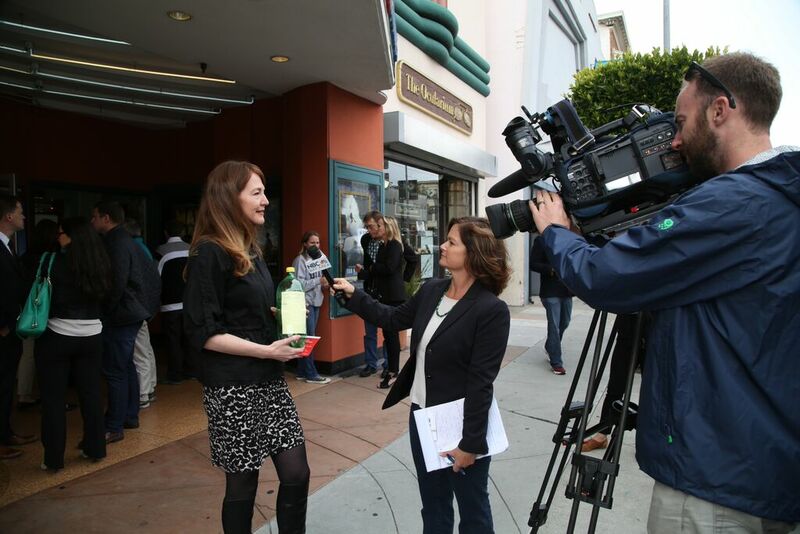 The last week in March 23-29 is National Tsunami Preparedness Week and San Francisco is hosting our annual tsunami preparedness walk. 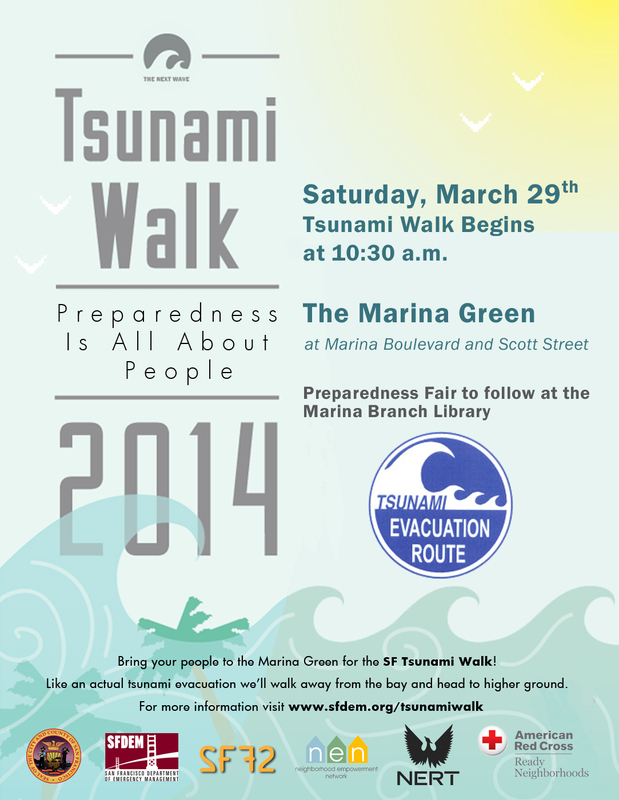 The SF Tsunami Walk begins on Saturday March 29 at 10:30 AM at the Marina Green (Marina & Scott). For more details visit www.sfdem.org/tsunamiwalk. In addition to the Tsunami Walk, the San Francisco Department of Emergency Management is conducting a three-day (March 26-28) tsunami exercise to practice with City’s alert and warning procedures, response capabilities, and recovery operations in a tsunami. For information on how can you become better prepared visit www.sf72.org. 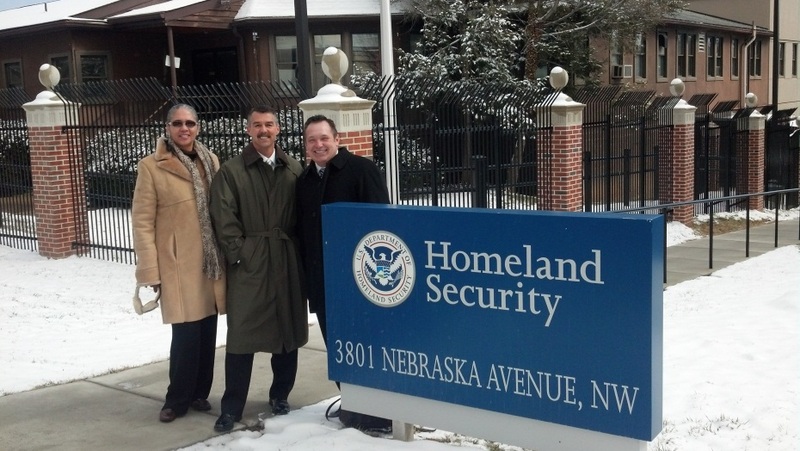 L-R: Oakland Director of Emergency Services Renee Domingo, Santa Clara County Fire Chief Ken Kehmna, and Bay Area UASI General Manager Craig Dziedzic at the U.S. Department of Homeland Security headquarters in Washington, DC. When the next big disaster hits the Bay Area, will our first responders have the right equipment, training, information, and public warning systems in place? To make sure that we do, the Bay Area relies in part on an annual federal grant from U.S. Department of Homeland Security (DHS) called the Urban Areas Security Initiative (UASI), to help prepare our region for a major disaster. While the grant is focused on terrorism, the planning, equipment, training, and exercises funded by the grant can be applied to most major disasters, from earthquakes to tsunamis to wildland fires to zombie apocalypse, as well as every day emergency response. We make sure to stay in touch with our friends in Washington to let them know what we’ve accomplished with our UASI grant, and what our ongoing needs are. Last week, six emergency managers from around the Bay Area did just that, traveling to the nation’s capital to tell our story to DHS to Congress. Our group included Bay Area UASI General Manager Craig Dziedzic, DEM Policy and Legislation Assistant Amiee Alden, and partners from Oakland, Alameda County, Santa Clara County, and the Northern California Regional Intelligence Center (NCRIC). 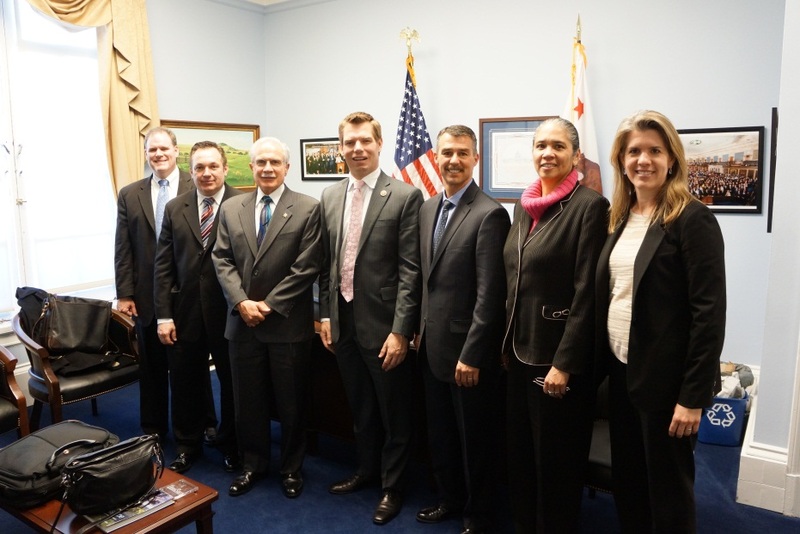 L-R: NCRIC Director Mike Sena, Bay Area UASI General Manager Craig Dziedzic, Alameda County Undersheriff Rich Lucia, Congressman Eric Swalwell, Santa Clara County Fire Chief Ken Kehmna, Oakland Director of Emergency Services Renee Domingo, and San Francisco DEM Policy and Legislation Assistant Amiee Alden, in Congressman Swalwell’s Capitol Hill Office. Our Bay Area emergency managers met with officials from DHS and the Federal Emergency Management Agency (FEMA) to discuss how our UASI grant has helped us get ready for the next disaster. We met with freshman Congressman Eric Swalwell (D-Dublin), and with staff for several members of the Bay Area congressional delegation, including Senator Dianne Feinstein, Democratic Leader Nancy Pelosi, and Representatives Barbara Lee, Anna Eshoo, Zoe Lofgren, and Mike Honda, as well as staff for both the House and Senate Homeland Security Committees. How Has the UASI Grant Helped the Bay Area? Interoperable Communications – We are over 50% complete with a project to upgrade the radios used by police, fire, and other first responders, enabling them to communicate with each other throughout the Bay Area. 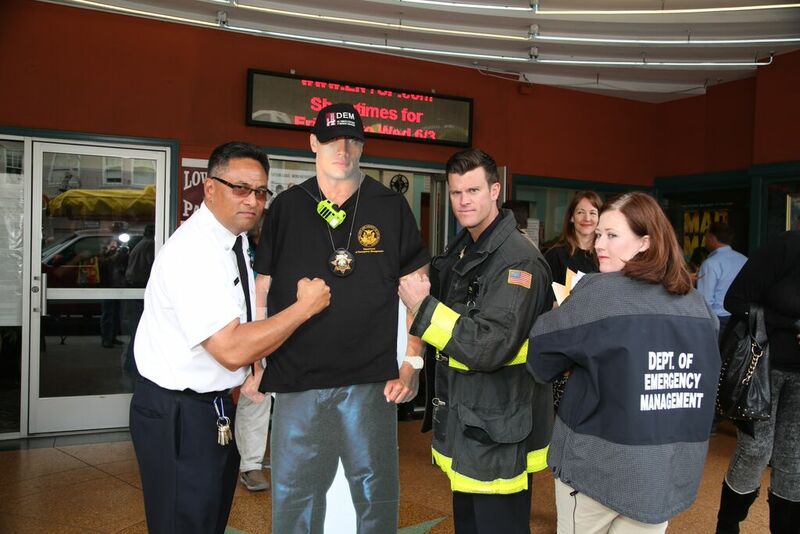 Training and Exercises – UASI funds the annual Urban Shield exercise, which trains 4,000 first responders from the Bay Area and across the country in scenarios like urban search and rescue. First Responders from Boston trained with Urban Shield, and credited this exercise with teaching them critical skills that made a difference during the April 2013 marathon bombing. Public Information and Warning – UASI funds AlertSF, which sends emails and texts to San Franciscans with critical information during emergencies – sign up at www.AlertSF.org. Cyber security – President Obama has made cyber security a top homeland security priority. More funding would help the NCRIC to catch more criminals who use cyber-crime to disrupt businesses, steal personal information, and cost our local economy. 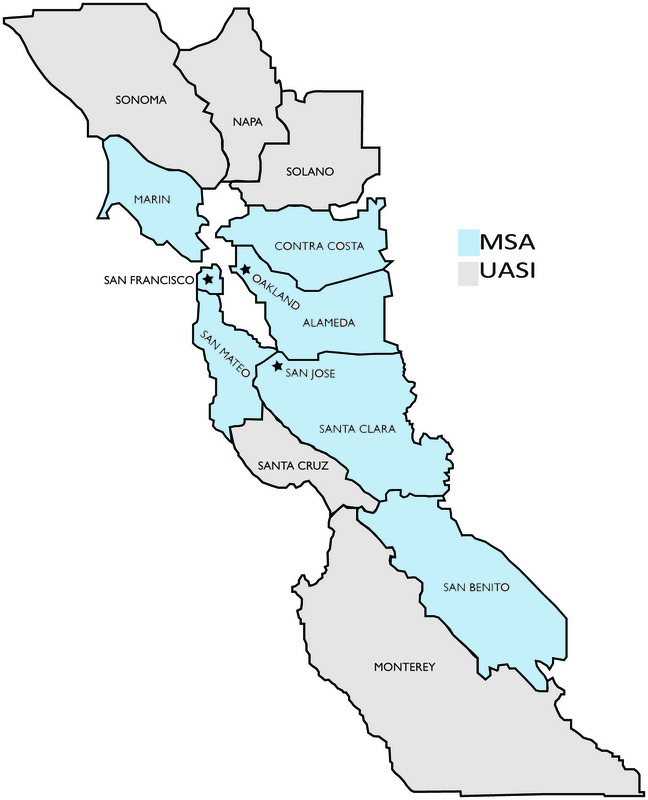 The Bay Area UASI includes 12 counties around and near the Bay Area. But when DHS decides how much money to allocate to the Bay Area each year, they only count 7 of those counties, leaving out Sonoma, Napa, Solano, Santa Cruz, and Monterey. DHS has determined that these counties are too small to count, under the grant guidelines. But we argue that these counties include critical resources, like Travis Airforce Base in Solano County, which may become a major hub for delivering resources to the Bay Area if a large disaster knocks out our local airports, as well as the Defense Language Institute in Monterey County, the premier Department of Defense facility that trains our military translators who serve overseas. We were grateful to Congressman Swalwell for raising this issue the very next day with the new Secretary of Homeland Security, Jeh Johnson, at a hearing of the House Homeland Security Committee. 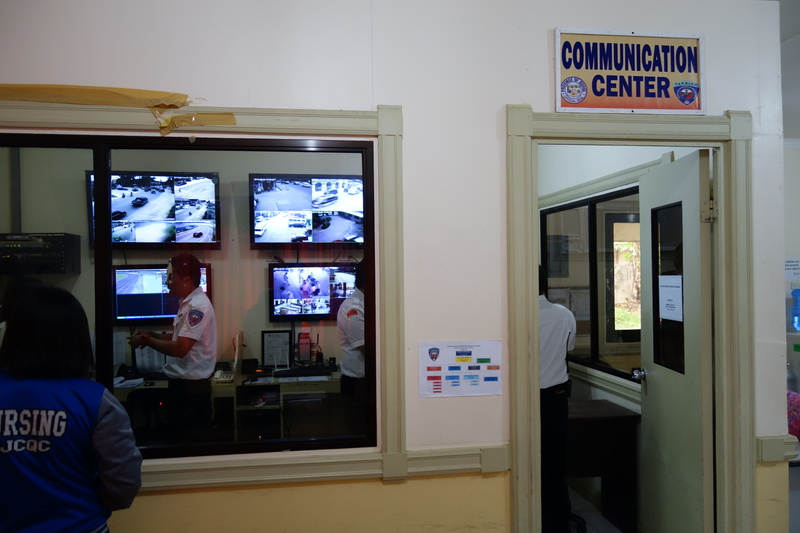 While SFDEM was visiting the TaRSIER 117 Operations Center an emergency call came in about a shooting in Taglibaran City. A call taker took the information from the caller and a radio dispatcher notified the Philippine National Police. Startup life… It’s a lifestyle and a popular hashtag on Twitter or Instagram. It’s the hustle and the grind. The marathon hack-a-thons and the late night drinks where ideas are born. It’s developing the next product or service that’ll change all of our lives. 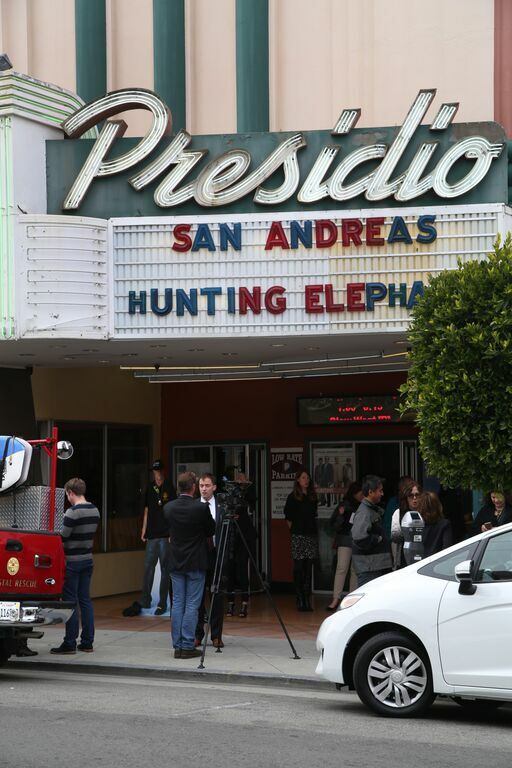 In San Francisco, it drives our economy but there have been some unintended consequences as well. Over here it’s different. In a two room building in the Bohol province of the Philippines they aren’t developing a new social network, e-commerce site, or dating service. The men and women of this startup don’t develop code or design products. Instead the scrappy staff that make up this startup are dispatchers, medics, and emergency managers and they are making TaRSIER 117 work with nothing more than sheer will. TaRSIER is short for Telephone and Radio System Integrated Emergency Response. 1-1-7 is the phone number Boholinos are encouraged to call when they have an emergency. TaRSIER 117 is housed in a two room building in Tagbilaran City, Bohol. 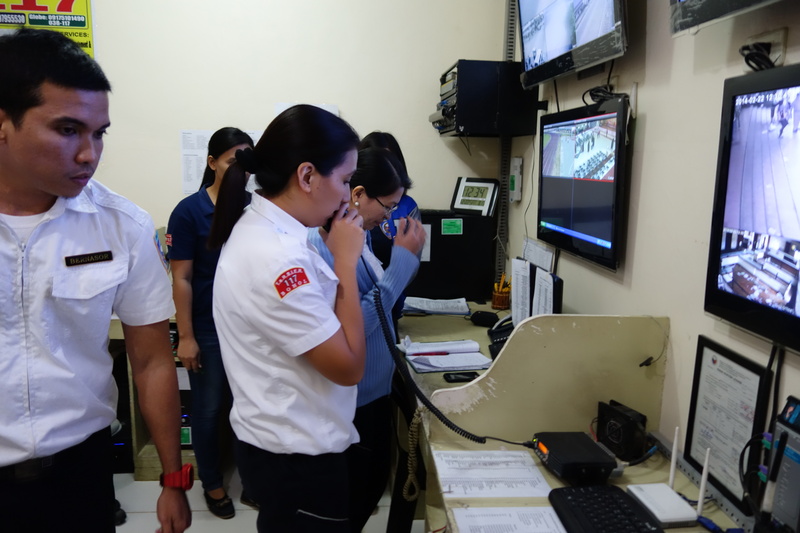 Darwin, Operations Manager, watches as a TaRSIER Call Taker and Dispatcher respond to shooting. Alfonso is a proud Boholino and TaRSIER was his idea. Many years ago his father, Alfonso Sr., had a stroke so they jumped in a car and rushed him to the closest clinic. It took an hour and half…the damage was done. Bohol had ambulances, they had firefighters, and they had police officers but they weren’t coordinated. On top of that each had their own phone number and often that number was different from barangay to barangay (neighborhood to neighborhood). What was needed was central place in Bohol where aid and assistance could be coordinated effectively. Years later, Alfonso became the Provincial Administrator and in March 2011 TaRSIER 117 was launched with a staff of 8. If TaRSIER was Alphonso’s idea, then Darwin and Mark are the key developers. Darwin was trained as a nurse, but had difficulties finding a nursing job in Bohol, so he worked for a customer call center. When he started at TaRSIER, he drew upon his background to develop the protocols and script his dispatchers use when people call. Mark is also a trained nurse and a former Philippine Red Cross volunteer. Mark uses his medical and Red Cross experience to train TaRSIER’s medical response and rescue teams. Together they are taking what they know and developing the lifesaving protocols, procedures and training for TaRSIER. If something isn’t working they learn from the experience and make adjustments. From what DEM could observe they are doing a phenomenal job with scarce resources and without formal training. 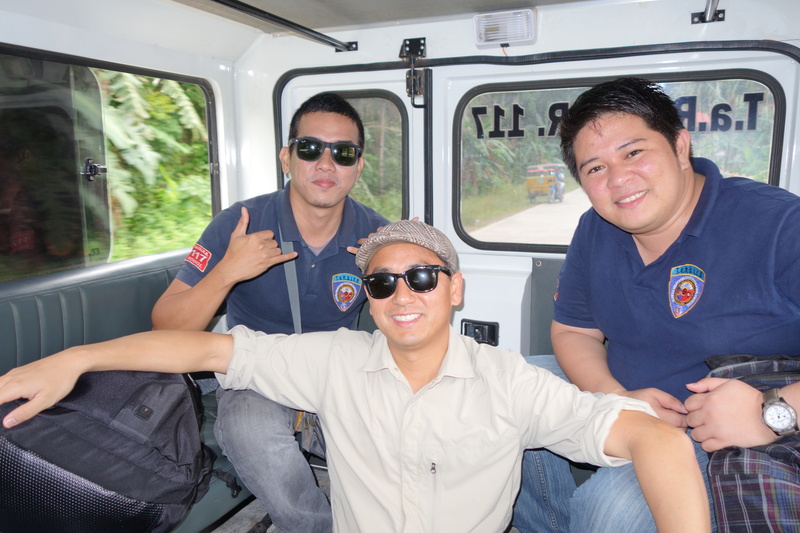 Darwin, Mark, and SFDEM’s Francis Zamora ride in the back of a TaRSIER response vehicle. 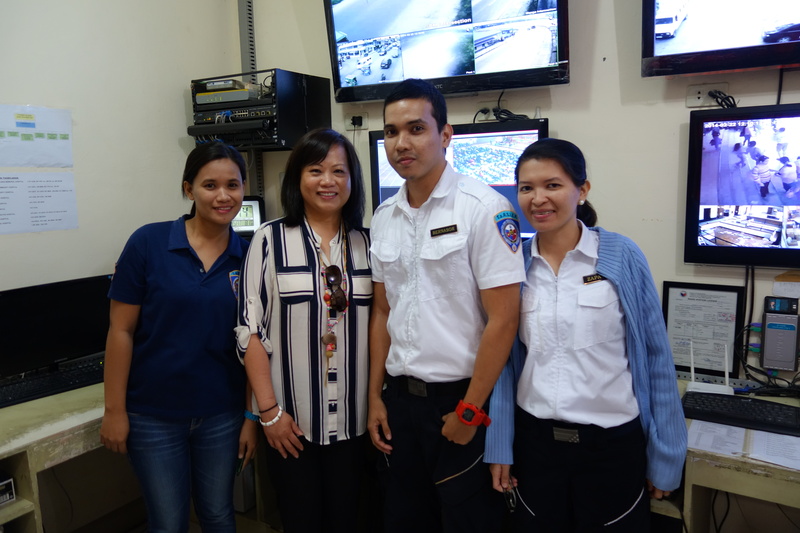 Cecile Soto, SF DEM 9-1-1 Operations Manager, with TaRSIER 117 Dispatchers. Rob Dudgeon re-lives his paramedic days and talks shop witth TaRSIER medics. TaRSIER has grown to 47 people who staff and operate Bohol’s emergency operations center, emergency dispatch, and provide ambulance and rescue services. While they have grown with the support of Bohol’s governor, like any startup, they have had their challenges. Educating the public to call 1-1-7 has been an enormous task. TaRSIER averages 250 emergency calls per month for population of 1.2 million. By comparison, San Francisco’s 9-1-1 emergency dispatch center averages more than 3,000 calls per day for a similar population. It’s not because San Francisco has more accidents, fires, or crime. It’s because many people in Bohol in still prefer to seek out help on their own or call the police or fire department directly. If they do call, sometimes it’s for non-emergencies. TaRSIER staff cited examples of people calling to ask what the traffic is like. In other instances, the caller gets upset and asks the dispatcher why they are asking so many questions. DEM assured our counterparts that we also get similar calls. Retention is another challenge for TaRSIER. Most of the team went to school to be nurses and have had a hard time finding a job in that field. As the staff gains experience and training, they often get offers for higher paying jobs as nurses or in more established emergency management departments in the Philippines. According to Alfonso, in the past year, 14 staff members have left TaRSIER for more lucrative or high profile opportunities. 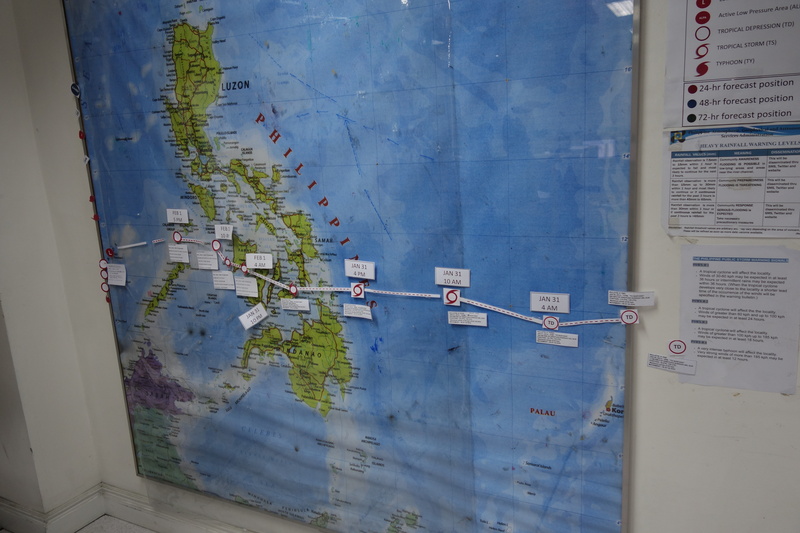 NDRMMC tracks the movement of a typhoon earlier this year. Not all emergency management departments in the Philippines are startups. The National Disaster Risk Reduction and Management Council (NDRRMC) is the Philippine government’s version of our Federal Emergency Management Agency (FEMA). 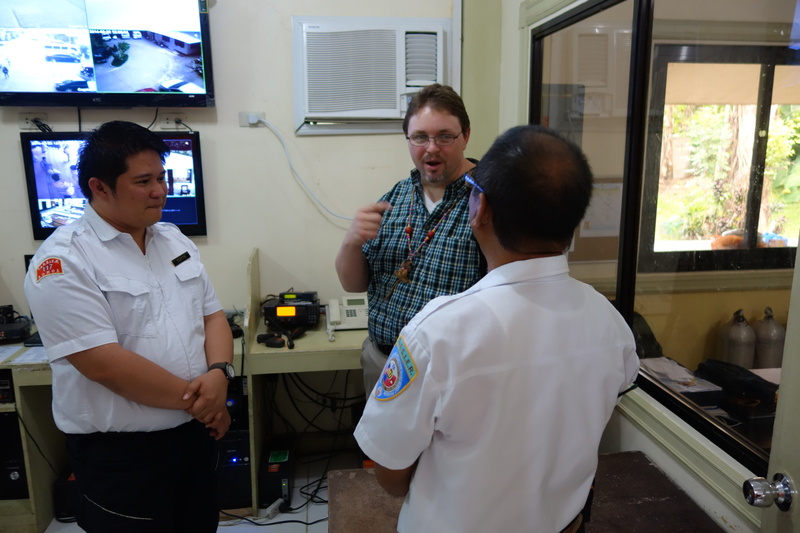 During our visit to NDRRMC headquarters at Camp Aguinaldo, we found highly professional, knowledgeable, and experienced emergency managers. In addition to earthquakes, the Philippines must contend with 15 to 20 typhoons each season. While NDRRMC is nowhere near a startup, their focus has shifted from managing the response to reducing risk through preparedness. The Philippines has invested time and resources in engaging the public through both digital and traditional social networks. Facebook is the primary method of digital social networking since it is what most Filipinos use. NDRRMC has also formed a public-private partnership with the country’s mobile providers and developed a smartphone app that provides useful emergency information that is set to launch in the summer of 2014. 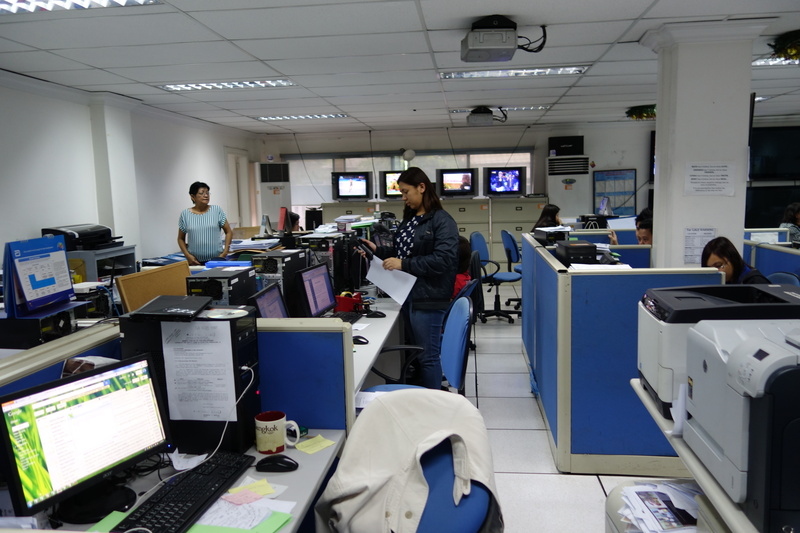 The staff at the NDRRMC knows that government can’t be the only answer before, during, and after an emergency. They are investing time in local leadership at the barangay level. People everywhere, whether it is in the Philippines or San Francisco, are likely to listen to information if it is from friend, family member, or other trusted source. This is why the NDRRMC is enlisting church leaders, school teachers, and barangay captains to help Filipinos get more prepared. Manila DRMMC official demonstrates call talking capabilities. Manila’s combined Emergency Operations and Dispatch Center under construction. Manila’s emergency management agency is in a state somewhere between TaRSIER and the NDRRMC. The Manila DDRMC (MDDRMC) has taken steps towards preparing for the hazards that may face the city’s 1.6 million inhabitants. 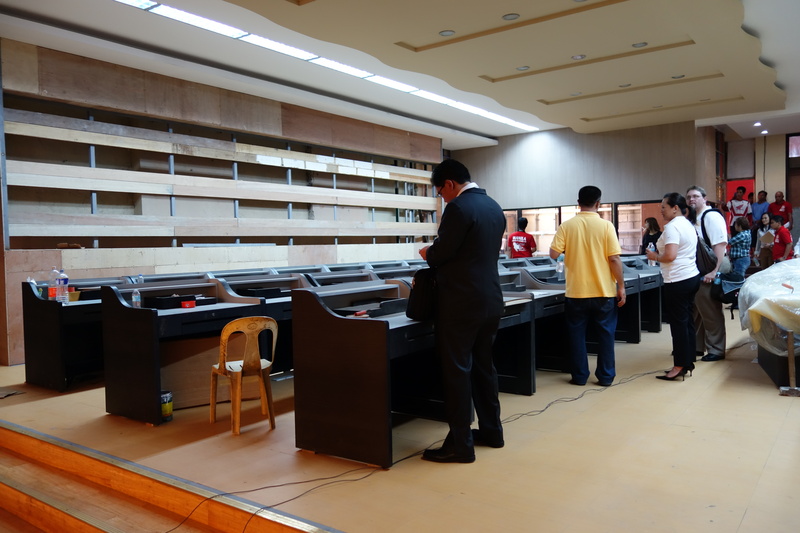 MDDRMC is building a new combined emergency operations center and emergency dispatch center at Manila City Hall. The center will coordinate everyday emergency calls as well as respond during special event or disaster. DEM was impressed by MDDRMC’s due diligence in designing their combined center. 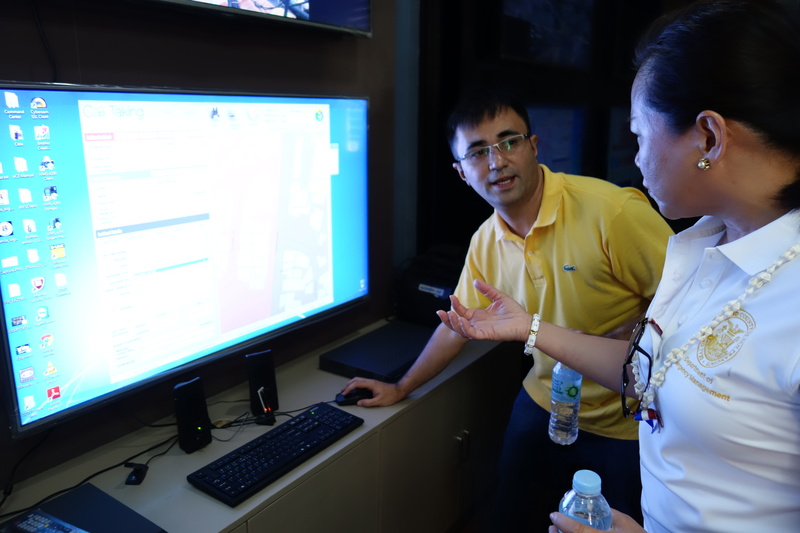 Manila officials built a small demonstration facility and then required every hardware and software vendor to provide a proof of concept for their products before asking for bids. As a result, they could test equipment and software before purchasing them. While TaRSIER, NDRRMC, and City of Manila are different stages of evolution and capability they were all put to the test in some way in the fall of 2013. DEM’s next post will focus on the response and recovery and lessons learned from the deadliest earthquake in the Philippines in 23 years and the strongest typhoon in recorded history. 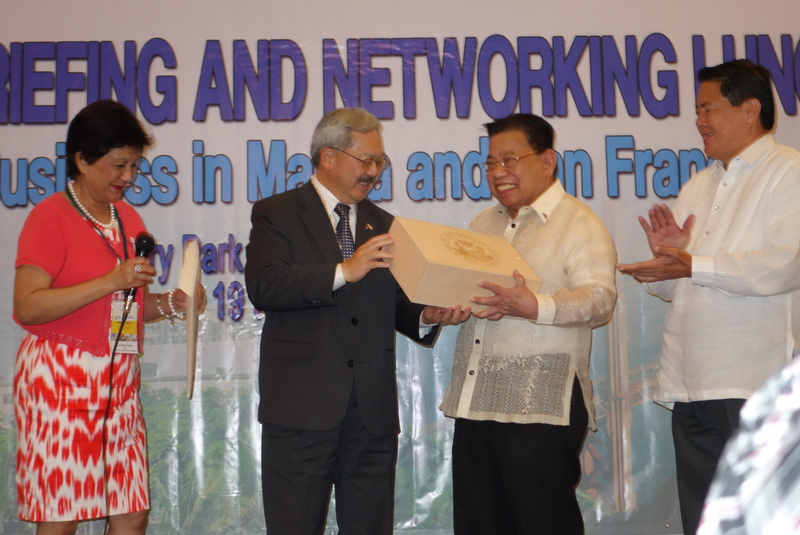 The first two days of the Mabuhay Manila mission were all about encouraging trade and business. The delegation visited the Center for International Trade and Missions where we previewed Philippine-made products that you may one day see at Crate & Barrell or Whole Foods. Delegates also participated in forums with the Philippine Chamber of Commerce and Industry about doing business in Manila and San Francisco. Naturally, as emergency managers, we had to find our own spin on things. We asked three things business leaders from Bay Area and Manila would share with customers about being prepared. SFDEM with delegates representing the SF Bay Area private sector. Dennis knows a thing or two about emergencies. He was on the ground with the Farmers Insurance Emergency Response team following the San Bruno gas explosion and fire. Have an emergency kit nearby and accessible. Have adequate coverage. Remember your homeowners or renters insurance doesn’t cover damage from an earthquake. 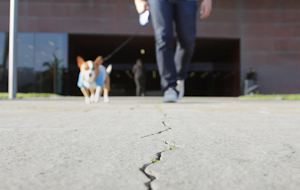 In the Bay Area, you need earthquake insurance too. Safeguard the things that are important to you like documents, photos, or mementos. 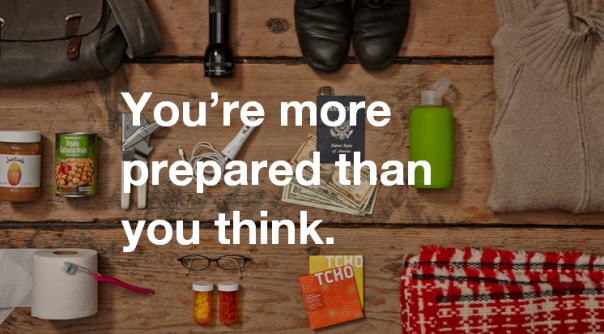 Jason specializes in travel and you’ll find that preparing for a trip is similar to preparing for an emergency. Safeguard your documents. Keep your passport and other important travel documents in a safe place. A TIP FROM DEM: Upload your important documents whether for travel or life to the cloud. Prepare a safety card with your doctor’s information, important phone numbers, and meeting locations. Sounds like preparing an emergency plan to us! Know the local culture. Customs may be different in another country. Researching your destination allows you have a smoother trip. Knowing to drop, cover, and hold during an earthquake will help you too! 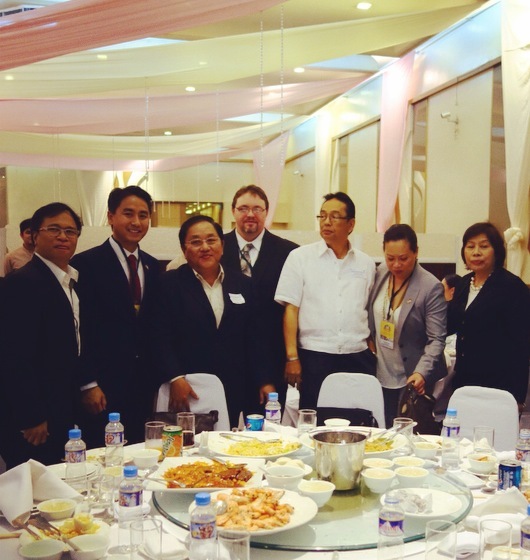 The Philippine Chamber of Commerce and Industry is enthusiastic about helping Filipinos in a disaster. Here are three things the private sector in the Philippines can do. Provide education and engagement. The chamber can educate their members and customers about how to prepare for an emergency. The PCCI is considering forming a private sector disaster coordinating council to help Filipinos. Businesses can help with response and relief. Private industry has the logistical capability and systems in place to deliver and distribute much needed supplies. PCCI can help the Philippines recover and get back on its feet. Their members have the capital and resources to invest and help Filipinos get back to normal. 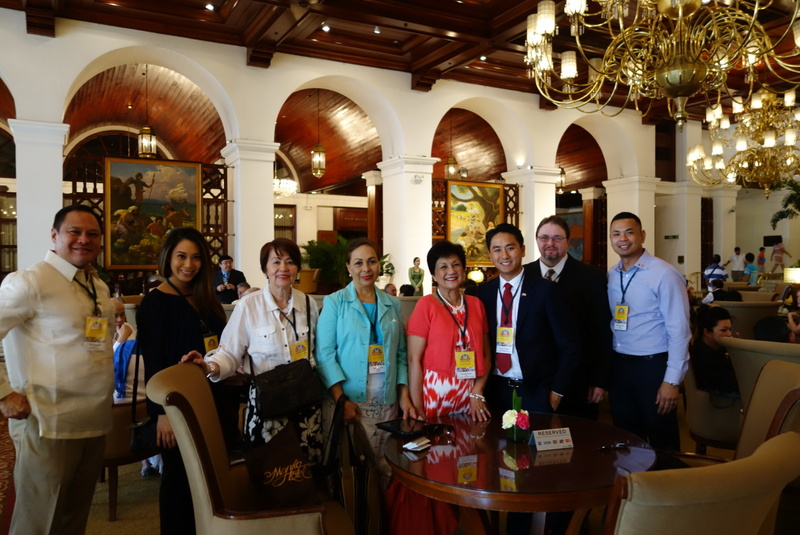 Our team enjoyed meeting with business leaders in the Philippines. Soon, the focus of our mission shifts to the business of emergency management. 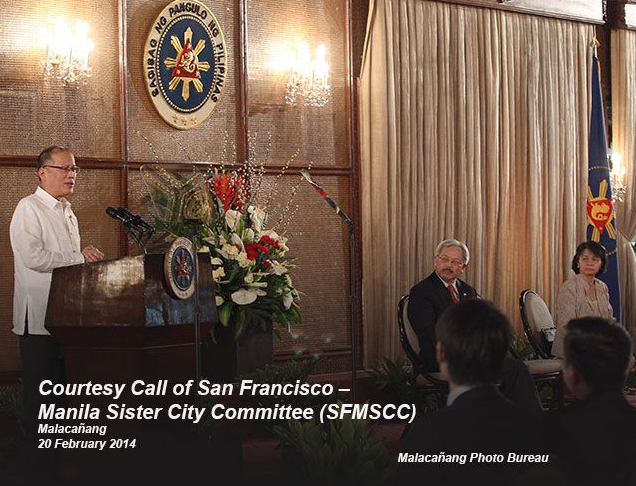 Beginning Thursday, the San Francisco Department of Emergency Management will spend our time in Philippines meeting with Filipino emergency managers, first responders, and local authorities involved with the Bohol Earthquake and Typhoon Yolanda relief and recovery efforts.